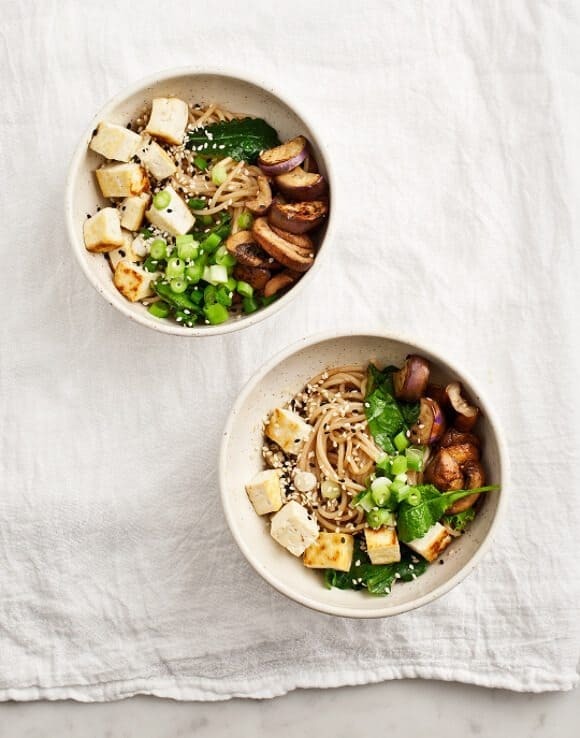 Crispy tofu, mushrooms, and eggplant are tossed with gluten-free noodles and sweet Asian-inspired sauce to make a healthy weeknight summer dinner. Vegan. I know I say this a lot here… but my absolute favorite meals are the ones that became something out of nothing. I realize this doesn’t look like quite nothing – some of you (mom) are thinking this looks like a lot of ingredients to happen to have on hand. But I promise… a half opened thing of mushrooms on one shelf, a couple scallions in the bottom left drawer, and these few poor eggplant counting down their last days… were not exactly screaming “yay dinner” in unison. “Old me” would have left these things aside, and gone to the grocery store with a brand new list… “newer me” would choose one item, look up a coordinating recipe and head to the store for more stuff. “Newest me” is way to lazy for any of that, but still requires an awesome dinner. Plus I just hate to throw things away. Cook the noodles according to package directions, or until al dente. Set aside. If the noodles are done before the rest of your components are ready, toss them with a little oil while you drain them so they don't stick together while they sit to the side. Make the sauce: Whisk together the miso, honey, mirin, garlic, ginger, and broth. Taste and adjust seasonings. Set aside. Prepare your tofu by slicing and draining it on some paper towels. Dab the tofu to remove excess water. Cook the tofu: Heat oil in a large skillet. Get your pan screaming hot and add the tofu. Leave it for 30 seconds or a minute, then toss it around, stir frying for a few more minutes until it is nice and golden. Remove the tofu from the pan and set aside. Cook the mushrooms and eggplant: Using the same pan as the tofu (wipe out any burnt parts), add some more oil, heat the pan up again and add in the mushrooms and eggplant. Add just a little splash of the sauce (you'll add the rest at the end). Stir fry until browned and the mushrooms are soft. The time will vary depending on the heat of your stove, I cooked mine for a total of 8-10 minutes. Turn the heat to low, add the noodles to the pan, and drizzle in more of the sauce. You might not use all of it (and it's on the sweet side), so start with about half, adding more later as you taste. Add the tofu back into the pan along with a few handfuls of greens and the scallions and toss everything together. Taste and add more of the sauce, or salt and pepper if you wish. 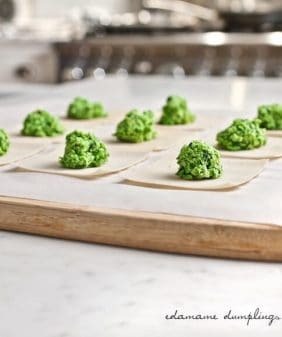 Remove from heat and serve, finishing with a drizzle of sesame oil and a sprinkle of sesame seeds. I’m with you, I usually have these ingredients in the crisper, and usually in need of something to fix with my eggplant that is getting closer to its date of being too late to create anything with. I too am on a mission to use up what I buy instead of tossing it out. Will totally give this a try. I love your website! And all of your recipes sound so good! I am with you, too, some of my favorite meals are created on the fly with what is on hand. There is something to be said for letting the ingredients shine and not trying to force things. Oh my goodness! I absolutely love this recipe! 🙂 it’s gorgeous and has everything I love! thank you for sharing! I love making do and being creative with what I have. As long as I do have at least a few things, of course. You’re lucky to have such a great combination of ingredients at hand, and also to have the instinct and knowledge to understand what you can do with them! Using up the contents of the crisper is a challenge for me too, but it looks like you met that challenge perfectly! Asian noodles and veg sound so calming and refreshing. Yum! 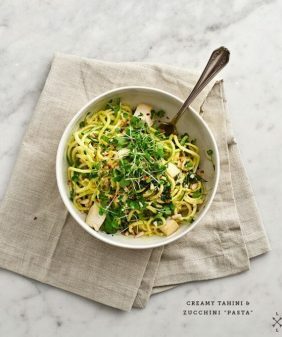 We have been eating noodle bowls for the last 2 weeks straight since my copy of Sprouted Kitchen came. 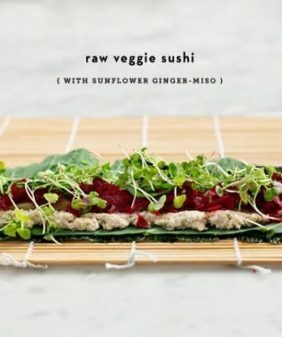 This looks so good, I’m going to have to try them soon. 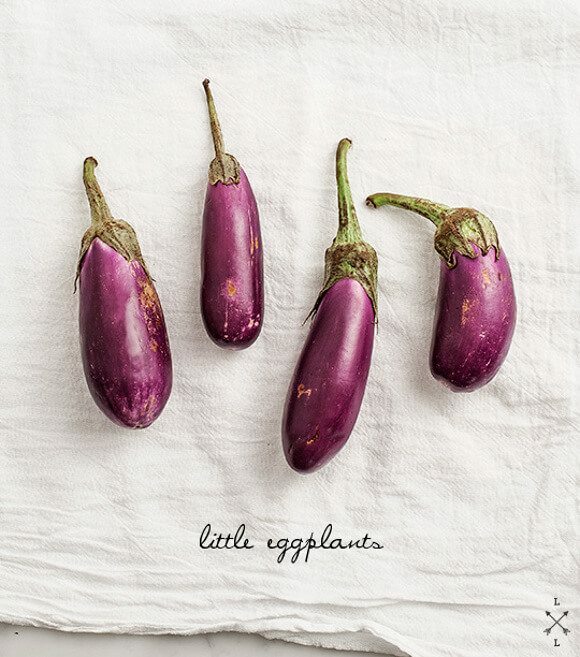 And, I *love* your eggplant photo. It’s lovely. This is one fab dinner combo! Love it! Looks like a beautiful dish. I can’t wait to replicate it in my own kitchen. Hopefully it will be as good as yours. Nothing makes me happier than a bowl of noodles and good things all together (and some chocolate at the end). Also, I always let eggplant get wilt-y/sad looking before I panic to throw it into something. 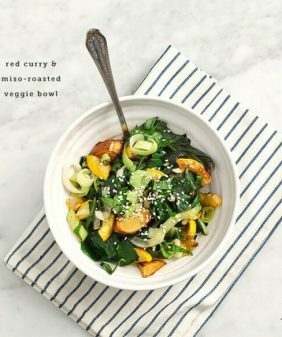 This bowl looks full of delicious flavour and wholesome goodness! I need to make it ASAP 🙂 I adore the photo! I love that your dishes very often have this Asian twist. Great! This is such a unique dish! Love it. I love those kinds of meals when everything just comes together just right. 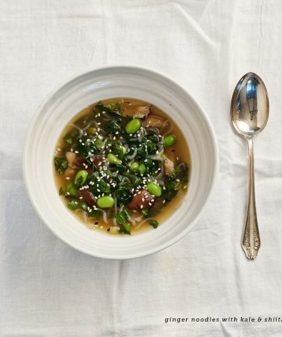 I’ve got some miso in the back of the fridge, so I’ll have to get my hands on some eggplant (but not mushrooms – yuck!) and give this a go. Where did you get those gorgeous bowls? Wondeful blog. 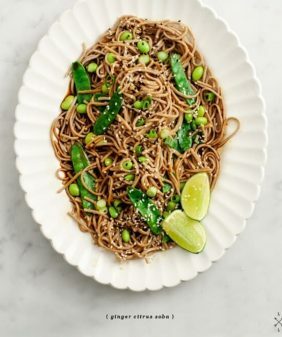 One advantage of noodle dishes is their easy preparation due to the fact that it can be made in just a couple of minutes and it can be mixed with just about any ingredient to add to its flavor. But I meant the right blend. My mission: figure out what to make with the remaining eggplant I had before going to the store. 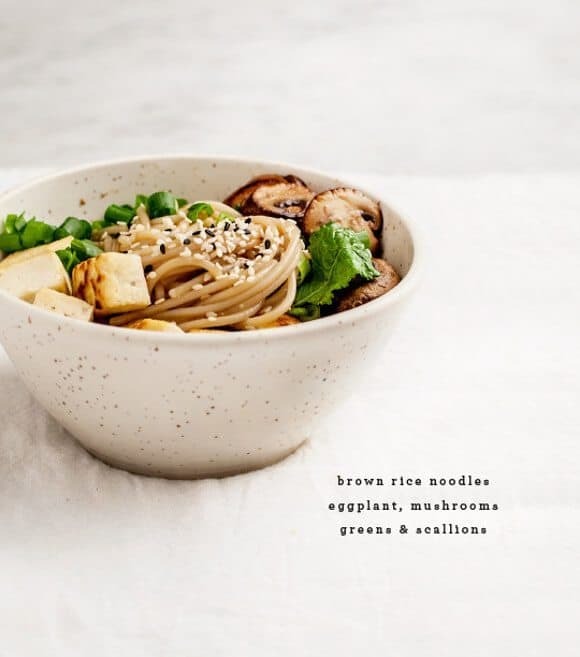 I landed on this recipe, only needed to buy tofu and mushrooms (and subbed rotini for soba noodles since I already had them in the pantry), and was so happy with the outcome! So so good! Thanks for sharing your creativity! Just made it. Never used miso paste before, so I’ll have to make more of your recipes using it. This dish is yummy. I had leftover eggplant (not even Japanese), that I had to use. I even forgot to add the greens and it was still great. I kept adding a little bit of the sauce and tasting and ended up using about 3/4 of it. I only stopped adding more because I was full. My tasting turned into dinner. Thanks. How are you using mirin or rice vinegar? One is sweet and the other tart. I’ll try both, but just curious. Also, for what it’s worth, this came up under vegan listings, but the honey makes it not vegan. Easy fix is to use agave. But if you’re using either honey or agave with the mirin, is it too sweet? Hi Jennifer – I haven’t tried it with red wine or apple cider vinegar – the acv would be a better option than red wine vinegar, but I really can’t say without trying it myself. It’s quite a bit different than rice vinegar.